A couple of solid snowstorms in these parts have already closed schools for a day and wreaked havoc on the highways. In times like these, when we’re tempted to go out on the patio barefoot and in shorts (well, I’m not, but I hear of such things), we can call on poetry to bring the season to its senses. Enjoy these 10 great winter poems to bring the color back to the season. The air is hot and then it’s cold. your mouth and say, snow. breaking away. Watch the fire. out of a hole you pour light into. Fragment, then drift or alarm. Should I remove my shoes? caught in her song and scrubbing. across my stare, do I dare to raise my hand? against half-hidden seeds and wrap of bark? than that, what becomes of love not blessed? unlatching the fortochka in the morning light. Let’s name them all, love, along the way. elusive as love’s many meanings last night. I’ll learn them all, love, along my way. So wild it was when we first settled here. Spruce roots invaded the cellar like thieves. Skunks bred on the doorstep, cluster flies jeered. Ice-melt dripped shingles and screws from the eaves. We slept by the stove, we ate meals with our hands. At dusk we heard gunshots, and wind and guitars. From a well that held water. We canvassed the stars. If love is an island, what map was our hovel? Dogs howled on the mainland, our cliff washed away. We hunted for clues with a broken-backed shovel. We drank all the wine, night dwindled to grey. on the ground, damp pockets of no longer. the pleasure of complete cover. and the sun is low in the white sky. — L.L. Barkat, author of Love, Etc. Photo by Larry Smith, Creative Commons license via Flickr. All poems are public domain or used by permission of author or publisher. Enjoy themed poems? 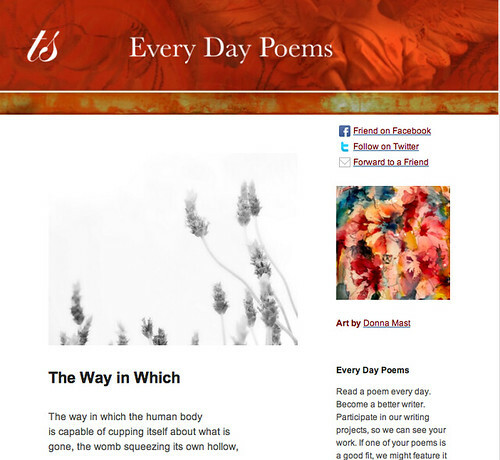 Subscribe today to Every Day Poems, the most beautiful and convenient way to read a poem a day, centered around a different theme each month. In July, we’re exploring Sand, Shells and Sea Glass. Holidays by Henry Wadsworth Longfellow—And Happy Ones, to You! Next week is supposed to be 20 degrees above average here. Talk about climate warming. Some of the cherry trees at the Tidal Basin already have bloomed. Oh, I know, Maureen! The maple outside my window has started greening its buds. In December. No, no, no. I think I like L.L.’s the best. Nice round up, LW. Comet, streaking across the sky. three inches of snow covered the valley floor. The physical laws of meteorology? ersatz crystals create this winter scene. Alas, they’re flakes of polyethylene. Paul, such a fun take on a white Christmas. Thanks for stopping by and posting your piece. I love snow as rare as Haley. Now there’s a fun project. Rewrite some of the “greats” in terms of current events and issues. How’s this for that challenge? he’s moved to North Alberta though. to the hills around Mt. Pocono. to keep the shrubs and driveway clear. and say it’s all a big mistake. and Scranton’s renamed Scranton Lake. It’s just a mile now to the shore. The family loves the new found shore. did jumble-tangle with the grub. Beware the Synthetiwock, my son! Professing they would aid weight loss. In bullion cubes and margarine. In salmon farms, pink eyed he hid. Love this wintery collection. That last stanza of Richard’s, Of Hat and Shoes, crushed me. The “half-hidden seeds” and then the last line— wow. Thanks for including my poem LW. I’ve been trying to put new life into an old deck in my spare time (that’s a laugh) for the last several months. So, I’ve appreciated this unseasonable warm (so far) winter. But we’re slowly dipping into the 20s here in the Ozarks. We don’t have to worry about seeing spring buds, the deer eat those as quickly as they appear. Got to get out the mint spray. So glad to be included in this “wintry mix!” Thanks!